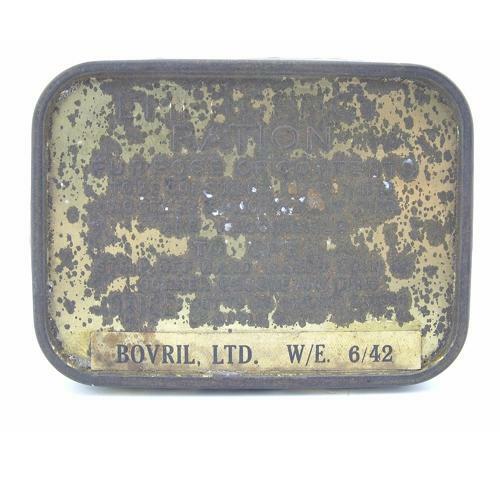 By Bovril Ltd. Gilt metal tin approximately 11 x 8 x 2.5cm containing a large block of chocolate. The packaging date on the label is 6/42. Text on the lid reads 'Emergency Ration - Purpose of Contents - To be consumed only when no other rations of any kind are procurable. To Open - Strip off band. Insert coin in corner groove and turn. Notice - not to be opened except on order of an officer'. The tin has surface wear and corrosion plus minor dents. The sealing band had been removed but the original contents remain bar one small corner. The chocolate actually smells surprisingly good but consumption is not recommended! Used by the RAF and other armed forces during WW2. Stock code S17954.